John Carney Reveals Mr. Mysto's Secrets! Great gift for budding magicians! Simple tricks are often the very best, and the most entertaining. But whether you are a child or an adult, it is important that you get off to a good start, establishing the fundamental principles that will make for a great magician. This book delivers that, and more. Designed for beginning magicians of all ages, this 80 page book contains material regularly used by both Carney and Mysto. 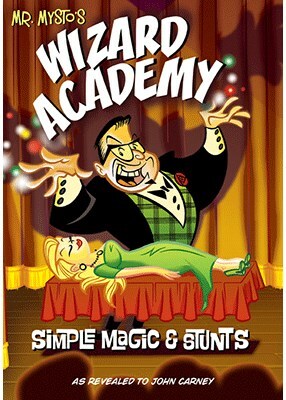 Wizard Academy has thirty-one tricks and novelties with paper clips, bottles and straws, pencils, coins, dollar bills, playing cards, and newspaper. And then there is some great impromptu dinner magic with napkins, plates, silverware, glasses, and rolls. Throughout the fun, there is plenty of great advice concerning practice, creativity, technique, and presentation. Here are all the tools needed for the beginning magician to advance to the next level, along with some great bits that even the pros will want to add to their repertoire.